The past week has been a period of cooling down and trying to remain calm. I feel very stretched thin. I tend to walk around forgetting what I needed to do next. Spacey. I feel very out of it. In a fog mostly. The school situation is constantly in my head and researching the possibilities is becoming more than tiresome. Caleigh's pain eased up on Saturday and Sunday. She actually had the best day she's had in four weeks on Saturday. Everyday since Sunday the pain has been inching back up slowly. Depending on the day she is stooling more than her normal. We got back all the bloodwork and luckly they were able to run everything they needed on the small amount of blood Caleigh gave up last week. Everything that they tested for was normal. My main concerns were her vitamins and trace minerals. I'm always worried she is deficient in something due to her short bowel. Caleigh's urine did come back with elevated white counts. So this morning we did another urine sample and sent off for cultures. The elevated counts could be anything from a UTI, bladder infection, kidney infection or just a contaminated sample. We should know in about 48 hours. Yesterday, we took Caleigh to a neuro opthamologist for an opinion on her cortical vision impairment. The appointment lasted over 3 hours and it was basically a complete waste of time. We were wanting an opinion on Caleigh's strabismus relating to her dystonia. Since her eyes are not fixed in a crossed manor, but rather move in and out of crossed. Basically another opinion on the eye surgery. This new doctor didn't want to step on our eye doctor's toes so he said that he wasn't qualified to say. I'm not even really sure what this doctor does, but he seemed nice enough. He verified that Caleigh does in fact have a cortical vision impairment. Her optical nerves and retinas look great. After being out of school for 10 days, Caleigh's teacher finally called to check on her. We were at our eye appointment so I missed her conference period to call her back. I sent an email in reply. Nothing Fancy. Caleigh's scope is scheduled for October 12th, next Wednesday. I've talked to our GI nurse quite a bit this past week about Caleigh's pain. The intense pain she had after starting school could be from her ulcerative colitis flaring up. Stress is a biggie when it comes to colitis, but this is just speculation until we see the results of the scope. We seem to always be guessing. At this time we are keeping Caleigh at home and keeping things calm and routine focused. In fun Caleigh news, plane as day she told me to "hurry up" on Sunday morning because I was in the kitchen and not getting her out of her chair fast enough. This was with her mouth not her iPad. She is starting to utter a few words here and there. They are sporadic and far between, but we love them when they come out. Caleigh loves to wash her hands when she is in her stander. 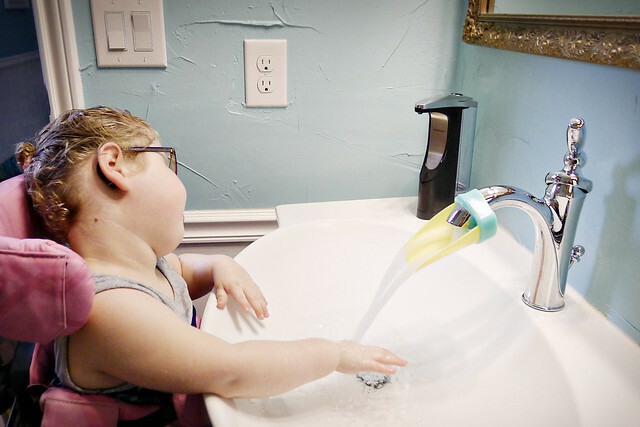 She has been just out of reach until I found this little faucet extender on Pinterest. Now the water goes right to her hands. I just love it.